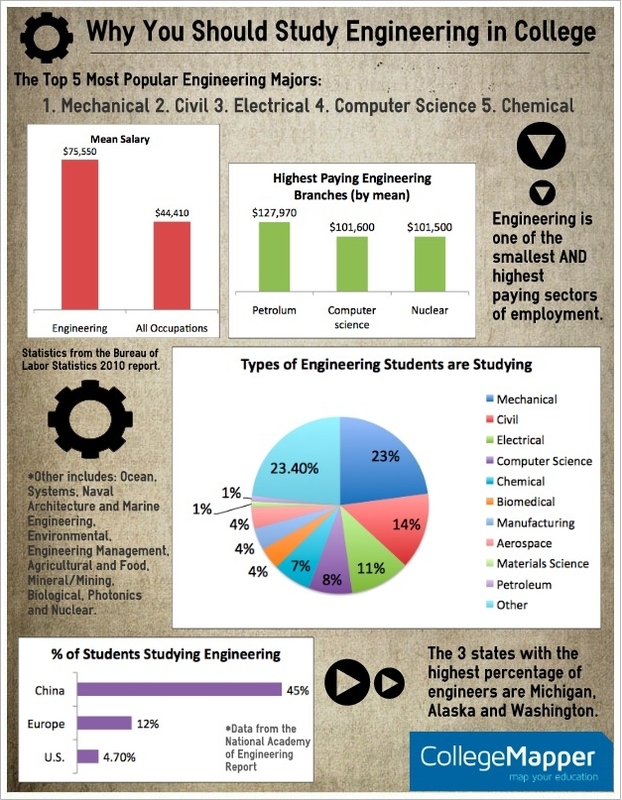 Since a small percentage of people study engineering, there is short supply. In the middle of 2011, the unemployment rate for engineers hit 2%, while the rest of the US lingered around 10%. If you have a fondness for math and science, think about engineering. The US mean income for all occupations is 44k a year, but for engineers the mean is 75K. The truth of the matter is, the more technical, skilled and specialized your knowledge, the fewer people there are with your skill set and the higher the salary that you can command. When you are trying to find a job, you want to be in a small pool of people. What exactly do engineers do? They make cars, planes, bridges, new chemicals, prosthetic limbs, new organs, computer chips, cell phone parts, rockets, ships and a million other extremely useful and innovative machines, systems and gadgets that we rely on daily. They get to solve problems like providing clean water, mining safely, protecting the oceans, creating new energy sources, improving factory efficiency and making things faster. Engineers work with sound, light, particles, microchips, cells, agriculture, computer code, air and atoms, among other things. In short, they create. If you’d like to consider engineering, do your very best in middle school math so that you can be on track to take Calculus and Physics in high school. If your high school offers AP or IB Physics, strongly consider it. If you are interested in Chemical or Biological Engineering, then steer toward AP Chem or AP Bio. Take double math and science classes in high school during Junior or Senior year, if you can handle that and still get a good GPA. A great GPA is better. You can also investigate taking a math or science class at your local community college in the summer. Join or start an engineering club at your school, based on the branch that interests you. Invite guest speakers and go into the community to job shadow–or better yet, host a career panel at your school and invite engineers from different fields to come in one night and answer questions for your club, to help you guys figure out which engineering area most interests you. You can also go to summer camps on engineering at local colleges; tons of colleges offer these, like: U Arizona, Cal Tech, Colorado School of Mines, US Coast Guard, U Michigan, U Miami, U Illinois, Purdue, Rose-Hulman, Notre Dame, MIT, Smith, Hopkins, U Maryland, Kettering, Rensselaer, U Oregon, Drexel, Clemson, Vanderbilt, Texas, UVA, and Wisconsin–and that’s not everybody. You could also go to a program at NASA, LEAD, SAME, MSOE, Research Science Institute, and Westminister Robotics (again, partial list). My perennial favorite is that you talk to engineers you meet and ask them what they love about their job. Ask them how they got into the field, what would they change about it, what do they find the most challenging, and how you can get started. An easy way to do this is to join the ACE Mentor Program, which pairs students with local engineers to learn more about the profession. The bottom line is, the possibilities of what you can create and solve in this field are infinite. Engineering is awesome. **A huge thanks to MIT, University of Washington, The Ohio State University and Purdue University for their help with this infographic!